President Donald Trump’s statement that the United States should recognize the Golan Heights as part of Israel was widely welcomed by Israelis on Friday but also triggered criticism that he was interfering in a close election campaign to help Prime Minister Benjamin Netanyahu. He said that Israeli voters are less attuned to the damage that Netanyahu is doing to the relationship with the U.S. Democratic Party by tying himself so closely to Trump. Polls have shown a slide in support for Israel among young liberals in particular and veteran Democrats formed a new group – the Democratic Majority for Israel – earlier this year to counter claims the party is not behind Israel. Rhynhold said Trump likely takes the attitude “if I do you a favor, you do me a favor” and the favor expected of Netanyahu would be to back the peace plan. But that plan could involve setting up a Palestinian state with a role for terrorist groups like Hamas. Israeli politicians have been wary of the price for the Trump administration’s pro-Israel moves. 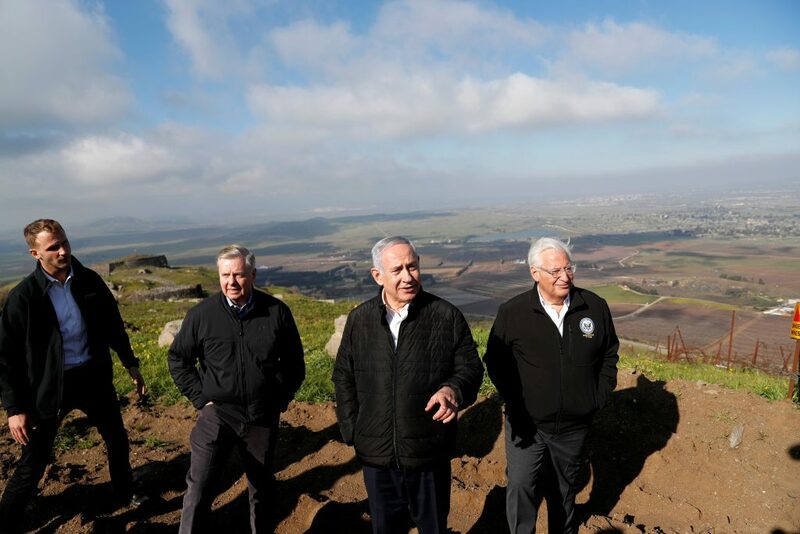 “With all the joy of American recognition of the Golan Heights, it is essential to say: The ‘Golan in exchange for Hamastan’ deal is a danger to Jewish settlements and to Israel,” Rhynhold said. “America should never support giving an inch of territory to the barbaric war criminal Assad,” she said, referencing Syrian President Bashar Assad. Syria, along with its allies Iran and Russia, has slammed the U.S. move.